The first and most immediate impression when going aboard the DP80' is that we are on an extremely high-tech yacht which, at the same time, is highly refined, elegant and has an innovative design. 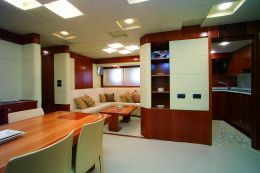 So much care was taken in building the DP80' that she seems to have been designed and built by a sort of partnership among several architects and yards. Draft from lower tip of propellers: 5'10"
Total engines weight: 13436 lbs. Of course the main elements for understanding the DP80' are the close collaboration between Delta Lab and the Dalla Pietà yard, the continuous dialog on customization and design between the shipyard and the Owner, the coordination with Filippo Rossi regarding the choice of materials, linings, details and finishing. Yet, at the light of all this, the DP80' astonishes and impresses because so many are the features we must observe and "understand". We shall limit ourselves to some essential notes. 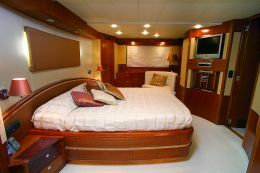 Starting from the lower deck, we immediately notice the painstaking care in offering great habitability as well as a special type of comfort in the living area, which includes a cozy salon to starboard and a dining room to port. 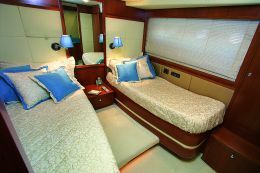 The master stateroom and the two or three cabins (depending on the chosen layout) extend the idea of cozy and elegant interiors initially noticed in the living area and convey the same sober and refined feeling. Even though the upper deck features the same elegance and sobriety as the lower deck, some elements must be extensively described. On this deck we appreciated the large sand- hued Rubelli sofa, the use of many natural materials - linen, silk, jute - for finishing and particulars, the fine leather insertions that decorate the table, the lamps exclusively designed by Marioni of Florence, the teak wood-blocks and the special satin cherry-wood finishing of all the furniture. It is not by chance that we started visiting the DP80' from the lower deck: it is only after appraisal of the habitability solutions and of the overall layout that details can be appreciated. In fact, the lower deck is worthy of a more extensive description. 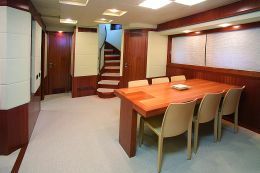 Here we find ivory-hued carpet of pure-wool bouclé, beach-wood insertions in the dining room table, Frau leather chairs, precious ivory-hazel mélange silks of the sofa and coordinated linings and details of the cabins and bathrooms, the latter featuring Bisazza mosaics and molded tempered glass tops. Everything transfuses long-lasting sobriety and good taste. What do the powerful and aerodynamic outside lines of the DP80' imply on the technological level? 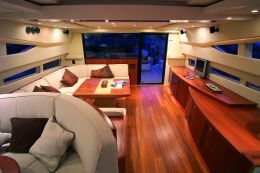 We especially appreciated the ample garage fitted under the foredeck, with launching and hoisting davit because this solution offers a greater cockpit under which a second garage for jet-skis with relative launching pad is fitted. 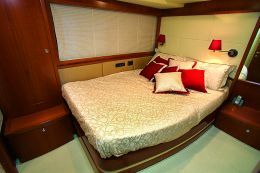 We want to conclude with the sailing impressions because trim and seaworthiness are the best features of all Dalla Pietà yachts. 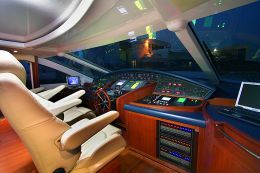 The DP80', the flagship, for now, of the Venetian yard fast yachts with flying bridge reaffirms, confirms and, where possible, improves such features. 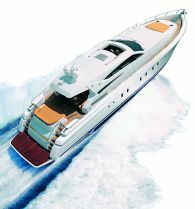 In particular, we point out to the manageable, agile, futuristic and efficient real-time electronic monitoring system of the two powerful 16-cyclinder MTU engines and to the structural fuel tanks fitted near the keel that lower the center of gravity of the yacht thus improving stability and trim.